The AKiTiO Thunder3 Duo Pro is the industry’s first Thunderbolt 3 based hardware RAID and display dock solution of 2016, highlighting the breakthrough speed possible with Thunderbolt 3 . The Thunder3 Duo Pro can deliver transfer speeds up to 770 MB/s, while simultaneously providing two 4K video streams to connected displays. You can expand storage capacity on the AKiTiO Thunder3 Duo Pro by adding both 2.5” SSD/HDD and 3.5” HDD drives, which can be easily installed. You can also daisy-chain multiple Thunder3 Duo Pros to further expand storage capacity. You have the option to connect the Thunder3 Duo Pro using Thunderbolt 3 to get a 40 Gb/s link, or to use USB 3.1 Gen 1 to get a 5 Gb/s link. 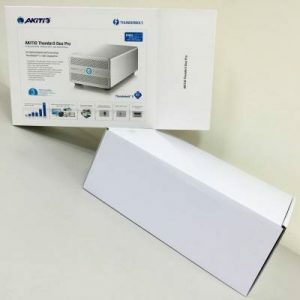 The AKiTiO Thunder3 Duo Pro also has an external DisplayPort port, which allows you to use the Thunder3 Duo Pro as a display dock, so that you can connect any DisplayPort monitor. Thunder3 Duo Pro can also quietly run fanless, making it the good choice for audio recording especially when SSDs are installed. Also, the Thunder3 Duo Pro really allows you do to more with your professional apps. For example, Sony Vegas and Adobe Premier users can edit and playback multiple streams of HD or 4K content, while simultaneously daisy-chaining multiple 4K displays. The Thunder3 Duo Pro also provides massive storage space for other popular applications, such as Lightworks, Corel VideoStudio, Pinnacle Studio, Cakewalk, Cubase, and ProTools. Once you open the outer box, you'll see an inner box which houses the actual Thunder3 Duo Pro. Like other Thunderbolt products, the Thunder3 Duo Pro looks good housed in its aluminum casing. The Thunder3 Duo Pro offers a 2-bay RAID enclosure supporting four RAID modes (RAID 0 striping, RAID 1 mirroring, SPAN, and Non-RAID). The Thunder3 Duo Pro features two Thunderbolt 3 Ports, a USB 3.1 Gen 1 (Type-B) port, and a DisplayPort video output to connect the latest 4K@60Hz displays. The AKiTiO Thunder3 Duo Pro looks and works great, and showcases the possibilities enabled with Thunderbolt 3 for creative professionals and consumers seeking the highest performance storage. Thunderbolt 2 external expansion chassis by Sonnet!